There are some people out there in the world who constantly think of trading. Are you a person who is into Forex trading and glued to your computer for updates and information? Do you regret about losing updates and deals while you are away from your system? If so, think it over again. You have a pocket assistant here to update you with all the latest trading information. MetaTrader 5 is a simple and practical solution for all your trading requirements. It is a compact mobile trading platform designed for Android devices, using which you can go on with Forex and Stock market trading at any time from anywhere in the world. 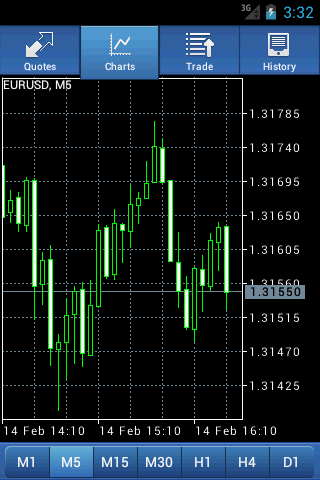 MetaTrader 5 allows you to access real-time figures on currency exchange rates. You can connect to a broker, receive quotes, monitor your account, view your trading history, make financial deals and do much more right from your Android device. You can use either real time trading accounts or demo accounts to log into the application. As an amateur trader, I logged in using the demo account. There are many trading options available inside the app. The currency exchange rates are updated every few seconds which would be helpful for you to make quick, real-time decisions. You can get up-to-the second quotes of various financial stocks. You can also access graphs and charts that display the latest trend of the selected item, through which you can compare and analyze the behavior of various financial items. The app also allows you to fine tune your search to view graph details based on different time intervals for an in-depth analysis. The interface of MetaTrader 5 is glossy and the navigational controls offer smooth interaction. The pinch and zoom properties of the chart section help in a great way to look into the trading details. But I am not sure if it is possible to trade on multiple instruments at the same time.